March 21 and 22 Summit being held in Hanoi, with 450 key stakeholders in attendance. 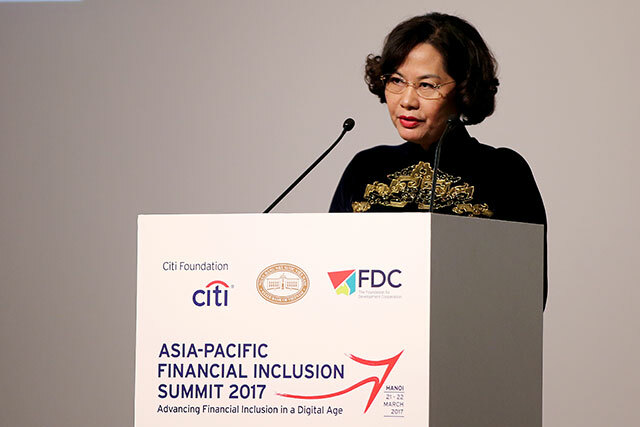 The Asia Pacific Financial Inclusion Summit 2017 opened in Hanoi on March 21 with the participation of over 450 key stakeholders, thought leaders, and practitioners, to further the financial inclusion agenda in the region. The Summit was organized by the Citi Foundation and the Foundation for Development Cooperation (FDC) in partnership with the Banking with the Poor Network and The Economist Group. This year the State Bank of Vietnam was official host. With the theme “Advancing Financial Inclusion in a Digital Age”, the Summit explored the opportunities and challenges for the next generation of financial inclusion and showcased the latest technology and innovations in financial products and services for the unbanked and underserved. Despite the great progress made over past decades in financial inclusion worldwide, some 2 billion adults remain unbanked, more than half of which are in Asia Pacific. “The inclusive finance eco-system is evolving to include not only financial service providers, both banks and non-banks, but new players, like mobile money providers and e-money operators, to name just a few,” said Ms. Brandee McHale, President of the Citi Foundation and Director of Corporate Citizenship at Citi. “What we will explore at this year’s Summit is the need to balance new innovative technological advances and creative partnerships with policy that will continue to not only help drive financial inclusion for low-income populations but also protect vulnerable populations,” she added. Over its two days, delegates to the Summit are debating issues, sharing case studies, analyzing trends, and exploring opportunities to drive collective action. Delegates are from prominent organizations such as the Vietnam Bank for Social Policies, BangkoSentral ng Pilipinas, the Ford Foundation, MicroSave, the Cullinan Group, Friend of Women’s World Banking, The Consultative Group to Assist the Poor, the World Bank Group, the United Nations, Grameen Capital, ACCESS Development Services, Visa, bKash, MasterCard, and Yale University.